Do you simply drink wine, or do you taste wine? Anyone can drink wine, but it takes practice to be able to recognize and distinguish a wine's characteristics. So whether you are an experienced wine connoisseur or a novice, welcome to our celebration of wine. We hope that you will learn not only how to taste wine, but also how it is created, why it tastes the way it does, and how to properly serve wine. How exactly is wine made? You are probably aware that wine comes from grapes, but what makes it different from grape juice? Chemistry and biology are what make wine unique and determine its flavour. With a more thorough understanding of the science behind the wine making process, you are more likely to enjoy and appreciate wine. Throughout history, many scientific discoveries have led to advancements in vinification (wine making), viticulture (the growing of grapes) and wine storage. Science is what gives wine its alcohol, taste, smell, and wine could not exist without it. Viticulture is the technical term for the study of vine cultivation, where the term "vitis" refers to the genus of grapes used in wine. Although, there are about 10,000 grape varieties, very few are used in winemaking. Wines differ in taste depending on the grapes, their vinification, their age, and also where their grapes are grown. The climate and soil of the vineyard has a significant impact on flavour, and certain grapes will flourish only under certain climatic conditions. A vineyard needs to be open to plenty of sun throughout the day. However, too much heat, freezing temperatures, or rain will destroy the grapes. The land must also have the correct soil balance, which affects the character of the grape. It must be well drained, and have the appropriate pH for the type of grape(s). The minerals of the soil are more important than fertility; they impart aroma and taste to the grapes. The winemaker's art owes much to his viticultural knowledge and expertise. These skills allow him to use the viticultural 'strengths' of an area to create the optimum quality wine at the optimum cost. Often the preferred vines for wine produce a low yield because of poor soil, making the roots work harder for nourishment. Invariably these grapes, if ripened, will be of superior quality and rich in natural sugars. Although winemaking has been practiced for centuries, it is an art little changed. The fresh grapes are de-stemmed and crushed. The juice is drained from the grapes, then from the stems and skins. The juice and natural yeast from the skins are added to a vat or oak barrel to ferment. The yeast converts the grapes' natural sugar into alcohol and carbon dioxide, which then bubbles and dissipates. The juice, now called "must", ferments at controlled temperatures for up to a couple weeks until the sugar is gone. The dead yeast are now either removed or left in to add complexity. The wine can be kept fresh or aged in a stainless steel vat or oak barrel; the oak imparts a vanilla, toast taste. The remaining particles are removed from the wine by draining and filtering. The wine is bottled and labeled. Wine is an art, its characteristics varying as much as the strokes of a paint brush. While wine, like art, can be very subjective, there are some general "guidelines" by which wine connoisseurs pass judgment. What makes a wine not just good, but exceptional? In the best wines, the sweetness of the grapes is balanced with their acidity. Climate changes, regional or seasonal, affect the taste of the grapes. A good growing season will produce a better tasting grape, and ultimately a better wine. As a result, each year the wine, or vintage, may taste different because the grapes are different. How do you read a wine chart? Wine charts are often divided into sections according to region, sharing both general climatic profile and soil composition. The wine is then given a grade based on its taste, aroma, balance, and other qualities along a point scale. Some charts are based on a 100-point scale, others on a 10-point. Sometimes the numbers are replaced with symbols that indicate if a wine is ready for consumption, or if it needs to age. There is a wide range of chart styles, be sure to read the key (if provided), but mostly be sure to take advantage of the wealth of information they offer. How you store your wine is very important if you plan on buying expensive wine to collect and/or age. Certain conditions need to be met in order for a wine to either mature properly or keep without spoiling. Most of the wines that you will want to store for maturation will be Reds. Almost all White Wines (and many Reds) do not need to age past 4 years, but some Red Wines require 10 years or more. Those made with Cabernet Sauvignon or Pinot Noir grapes mature over such a period. The key thing to remember is stability. Changes in the light, temperature, and position over time will affect the content, with older wines more susceptible to subtle variations. Don't have a wine cellar? While a cellar is ideal, an enclosed closet or cupboard may be substituted, assuming that the light, temperature, position and humidity are stabilized. Temperature: The ideal is 9-15 degrees C, 48-58 F, where too warm causes wine to mature too quickly, and too cold can stall the maturation. Light: Dark is preferable, as wine chemistry can be changed by exposure. Position: With the bottle on its side, this keeps the cork moist. If the cork dries, air could enter and oxidize the wine. Humidity: A level of 60 to 70 percent is ideal. Mold can form and labels can be ruined if it is too humid. How do we taste wine? Because each part of the tongue is responsible for a designated taste sensation, wine must be swished around in the mouth for it to reach all areas. In addition to taste, the role of our sense of smell is just as important. Have you ever tried desperately to detect flavor from food or a beverage when you had a terrible cold? You probably tasted very little, if anything at all. There are aroma receptors located in the back of the mouth, the throat, as well as the nose, and these transmit the information to the brain. The most important quality of a wine is its balance between sweetness and acidity. While our sense of taste would seem to be the most important in exploring a wine, the sense of smell largely determines what we taste. There are aroma receptors on the back of the tongue which help clarify the taste of the wine, and this is why it is important to slosh the wine to all parts of the mouth and draw in some air. Wine is not just like art, wine is an art. It can be subjective in nature, but there are some general "guidelines" by which wine connoisseurs judge a wine. It is very easy to learn the techniques of wine tasting, and if you already enjoy wine, learning the nuances of wine tasting will simultaneously increase the pleasure you derive from tasting. You can tell much about a wine simply by studying its appearance. The wine should be poured into a clear glass and held in front of a white background (a tablecloth or piece of paper will serve nicely) so that you can examine the colour. 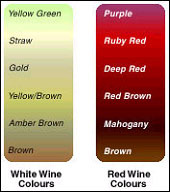 The colour of wine varies tremendously, even within the same type of wine. For example, white wines are not actually white; they range from green to yellow to brown. Paler whites are lighter. More colour usually indicates more flavour and age, although a brown wine may have gone bad. Where as time improves many red wines, it ruins most white wine. Red wines are not just red; they range from a pale red to a deep brown red, usually becoming lighter in colour as they age. Rim colour: You can guess the age of a red wine by observing its "rim". Tilt the glass slightly and look at the edge of the wine. A purple tint may indicate youth while orange to brown indicates maturity. Swirling: Swirling the wine serves many purposes, but visually it allows you to observe the body of the wine. "Good legs" may indicate a thicker body and a higher alcohol content and/or sweetness level. Take only one deep whiff. Either way, after you smell the wine, sit back and contemplate the aroma. Don't try to "taste" the wine yet, concentrate only on what you smell. What did you smell? It may be difficult to describe in words when you're a novice, but after trying many wines you will notice certain similarities and differences. Sometimes a certain smell will be very strong with underlying hints of other smells. Take your time and differentiate by labeling an aroma you will probably remember it better. You may even want to keep a notebook of your impressions of wines, and/or save the labels; next time you see the wine you won't have to purchase it or open it to know if you like it. Later, as you taste the wine in your mouth, your sense of smell adds complexity to the taste. Your tongue only recognises four sensations (sweetness, sourness, saltiness, and bitterness), while aroma receptors at the back of the tongue clarify the taste. Your sense of smell can also warn you that a wine smells "off", or is defective. Initial taste (Or first impression): This is where the wine awakens your senses (your taste buds respond to sensations). Taste: Slosh the wine around and draw in some air (even if you do look funny in front of your dinner guests). Examine the body and texture of the wine. Is it light or rich? Smooth or harsh? After taste: The taste that remains in your mouth after you have swallowed the wine. How long did the taste last? Was it pleasant? After tasting the wine, take a moment to value its overall flavour and balance. Is the taste appropriate for that type of wine? If the wine is very dry, is it supposed to be? Some serious wine connoisseurs assign a point score to a wine to determine its quality. While this method can be useful, it is in no way necessary to determine a quality wine. The more different wines you try, and the more attention you pay to each wine, the better you will become at ascertaining and describing each wine's characteristics. You spend the money and time to buy a fine bottle of wine. Why not enjoy the wine's full potential? Or maybe you don't really care how your wine is served, but perhaps your dinner guests will? You take the time to prepare dinner right-why not wine? Serving wine in the glass appropriate for its type is not just to impress your guests, but it serves a purpose. For example, smaller glasses are used for Port and Sherry because they are so rich and are consumed in smaller qualities. Pouring wine correctly can add class to the occasion and is a matter of courtesy. Decanting wine is pouring wine into a decorative container for the purpose of removing sediment. By taking a few precautions and following some guidelines, not only will the presentation be better, but your wine can actually taste better. How is a red wine different from a white wine, other than in colour? The wines have a very different set of characteristics, and there are a number of reasons for the variations. One difference is the grape(s) used in the production of the wine, as each grape has its own distinct qualities and flavour. The wine maker can also adjust the taste of the wine by controlling the yeast (amount, type and duration of fermentation), sugar and alcohol content, bubbles. The wine should be balanced in acidity, sugar and alcohol content, and elements (fruit, nuts and oak if aged in an oak barrel). White wines are usually served chilled because the acidity tends to be more apparent when the wine is warmer. A wine with too high an acidity can be unpleasant and make your mouth water, but too low produces a dull wine. A good red wine should be balanced in acidity, sugar and alcohol content, elements (Fruits and berries, spices, oak), as well as tannins (from the grape skins and stems). Tannins can be both beneficial and detrimental to a wine; young reds can overwhelm you with their tannins, but tannins are what permit many reds to age so gracefully, softening and improving the flavour. Red and white wines are about the same acidity, but tannins give red wines more complexity that disguises some of the acidity. You can feel the tannins in your mouth; they give the wine texture and body. Sparkling wines are different from both red and white wines in that they have "bubbles", and they undergo special methods designed to help retain the bubbles. This is the "champagne methode" for producing Champagne. The carbonation gives sparkling wines a very distinctive taste that can range from very dry to very sweet. So why can't you drink a white wine with beef or pasta? Why can't you drink a red wine with seafood? There are countless books written on the "correct" way to match wine with food, but the wonderful simplicity is that you can drink whichever wine you desire. Certain aspects or spices in the food may be masked by the wine, or altered in taste, but that simply means that neither of the flavours will be enhanced. Match opposites: A sweet wine, such as the White Zinfandel, goes excellent with Pacific Rim and other spicy cuisine. Sparkling wines cut intensity: They are good with salty and smoked foods. For cheaper wines: Drink a cheaper wine with cheese; the fat and protein makes the wine taste better. Avoid fruits: Most are acidic and clash with the acidity of the wine. Fish is often cooked or served with lemon; the acidity of the lemon enhances the fish without hiding the flavour. A white wine is less powerful than red and its more apparent acid matches the subtle flavour of the fish. Red wine generally won't match because it is too strong, its acidity too masked. If you must have a red wine, try one high in acidity and very low in tannins, and choose a stronger or grilled fish with more flavour. Beef and other heavy meat dishes are generally strong and full of flavour, and red wine matches in strength. White wines just don't have the strength of the red. If, however, you must have a white wine, try a strong white high in alcohol and with oak undertones such as a complex Chardonnay.